Week 1 recap: Well, that was a mess. Hell is a third-and-long bubble screen. Yes, the Steelers were manhandled at home by the team that gave up the most points in the NFL last season. And yes, Pro Bowl center Maurkice Pouncey’s season is likely over after tearing his ACL and MCL in a case of friendly-fire. And yes, the Steelers did not have single rushing first down. Inane rage-blindness aside, here’s a more telling visual for the state of the Steelers right now: In the second quarter, the Steelers had the ball near midfield. It was 3rd and 11. Roethlisberger lined up in the shotgun, presumably readying to do what he does best in 3rd-and-long situations — buy time in the pocket, extend the play, scramble away from pressure if necessary and throw the ball down field. It’s the classic Roethlisberger formula. Unfortunately, we’ve seen very little of this impromptu brilliance under offensive coordinator Todd Haley’s frustrating and at times stupefying reign. There would be no ramshackle Roethlisberger magic on Sunday. Needing 11 yards to keep a vital drive alive, Roethlisberger instead threw a bubble screen — yes, a bubble screen — to Emmanuel Sanders. The play went for negative-two yards. Coming off the field, Roethlisberger looked worse than pissed off. He looked totally exasperated. In theory, Haley’s offensive philosophy sounds just fine: Take the pressure off of your beaten-up, 31-year-old franchise quarterback by employing a more high-percentage short passing game. This is the sales pitch that won Haley the job. 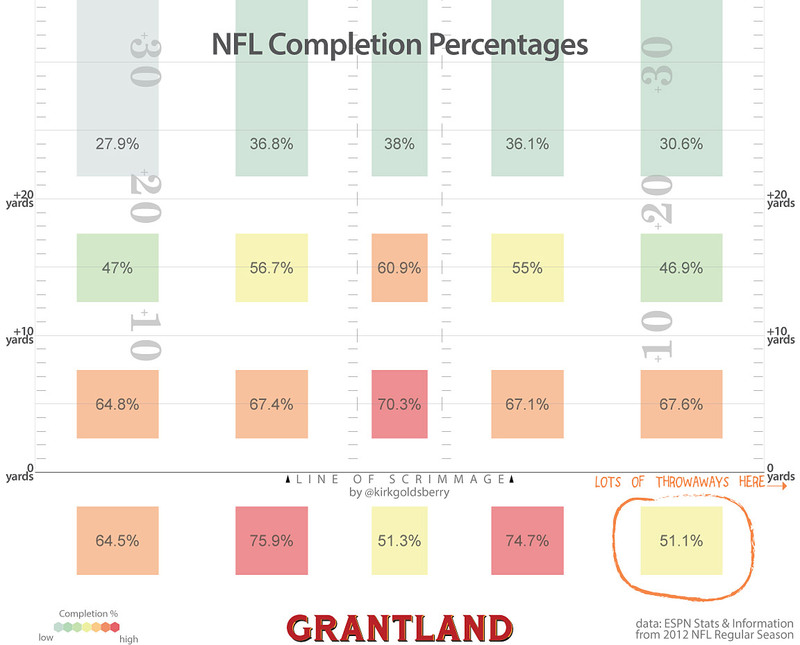 If you look at the heat maps of where NFL offenses have the most success passing, like this nifty Pass Atlas from Grantland, Haley’s pitch makes sense. There’s just one problem: Roethlisberger is not like Tom Brady or Aaron Rodgers or Drew Brees. He’s nothing like Kurt Warner, the quarterback Haley had the most success coaching. Roethlisberger is a different football brain with a very different set of strengths. And yet Haley didn’t seem to consider this very important nuance when he arrived in Pittsburgh. Instead of working closely with Roethlisberger to create a hybrid playbook that made the Steelers' veteran receivers comfortable and gave Roethlisberger room to be creative (his greatest strength), Haley installed in his own playbook and terminology with zero collaboration. “I joke and say that my final paper for Miami [of Ohio] on Tibet was a lot easier than the Rosetta Stone we’re doing now here,” Roethlisberger said when Haley first came to town in May 2012. Even when Haley’s plays were identical to Bruce Arians’ old plays, Haley insisted that the Steelers use his terminology. Three weeks into the 2012 season, Roethlisberger had already started using plays from Arians’ old playbook in a loss to the Oakland Raiders. When asked why he decided to use those plays during the no-huddle offense late in the game, Roethlisberger sniped, “Because they were going to be open, and they worked every time I did, so that was good." So that was good. Hoo, boy. On Sunday, the Steelers had their only offensive success late in the fourth quarter with Roethlisberger in the no-huddle. This time he didn’t say whether or not he went off-playbook. These two are like the sad-sack couple passive-aggressively sniping at one another in the food court of your local IKEA. It’s been over since the day Haley walked into the Steelers’ practice facility with zero Super Bowl rings on his hand and zero desire to compromise. Wow, they sound like best buds! It reads like an Anthony Weiner apology speech. And what’s with this: Seen as a necessity? Who exactly saw this change in offensive philosophy as a necessity? If it was to prolong Roethlisberger’s career, it isn’t working. He was sacked five times on Sunday. And even if he keeps his jersey clean, what’s the point of five more seasons in an anemic offense that doesn't play to his strengths? Bummed-out Steelers fans who had the courage to tune in to the 4:45 game between the 49ers and Packers must have felt like they were watching a different sport entirely. Both teams finished the game with 23 first downs. The Steelers managed 13 on Sunday. Mike Tomlin loves reminding everyone that the NFL is a results business. Under Arians in 2011, the Steelers were 12th in the NFL in total offense. Under Haley in 2012, they dropped to 21st. 2013 was supposed to be different. Week 1 certainly was. The offense wasn’t just out of sync. It wasn’t confused or off-kilter. It was simply flat-out depressing. Look around the league. Quarterbacks with half of Roethlisberger’s talent are consistently throwing for 350 yards under the NFL’s new passer-friendly contact rules. “Genius” offensive coordinators are a dime a dozen. Elite quarterbacks come along once in a lifetime (literally in the case of Jets, Bills, Raiders and Browns fans). At best, the Steelers have five more seasons of Roethlisberger in his prime. They can’t afford to waste even one of those seasons throwing bubble screens. Pulling No Punches is former Pittsburgh Magazine sports editor Sean Conboy's witty commentary on the best (and worst) in local sports. 2012 CRMA Blog of the Year. All killer, some filler. Kids can join Big Bird, Elmo and more Muppets as Sesame Workshop plans three days of events during a stop in Pittsburgh in June. Nation’s top speciality food festival to spill out onto Ft. Duquesne Boulevard. Pittsburgh says hello to Alta Via, Leo. A Public House, a new Milk Shake Factory location and more. Look for New Mexican cuisine, customizable chicken and more as half of the Pittsburgh Galley Group concepts change in the next few months. Not just good stuff. Great stuff. For those who can’t stand the idea of leaving their dogs home alone on a beautiful day, these dog-friendly stores, restaurants and bars in the Pittsburgh area welcome humans and canines alike. Even novice runners can work their way up to these fun and (mildly) challenging races. A weekly look at the games people are playing and the people who are playing them. The answer to a self-inflicted postseason sweep must begin with getting the players and their coach back on the same page regarding what’s required for survival in the playoffs. Patience, persistence and taking what the game gives is critical in Round One. The movies that are playing in Pittsburgh –– and, more importantly, whether or not they're worth your time. Everything you need to know about getting married in Pittsburgh today. A graffiti-decorated cake, a sequined jacket for the groom and a violinist playing hip-hop covers wowed guests at this Strip District wedding. Brides choosing one (or several) different colors, but leaving the design up to the bridesmaids, help attendants feel comfortable within their own budget. Featuring innovative indoor animal shelters designed by local architects and artists going up for auction, the event at PerLora raises money for Animal Friends. After designing a room around their child’s gender reveal, Chris and Stacy Galiyas are shopping around a reality show where they do the same for other expectant parents.